I just returned from QuiltCon in Savannah where I taught three classes, one of which was Improv Paper Piecing, based on the shape based section of my new book, Improv Paper Piecing: A Modern Approach to Quilt Design. I really enjoyed teaching this class. While I was writing this book, I was already anticipating what a fun workshop it would make, and I think it did! At least, I know I had fun seeing the designs that my students were coming up with, helping them to figure out their numbering order for paper piecing, and then talking about all the possibilities for color placement and layouts to make their blocks successful. Everyone made interesting and unique blocks. You can see some of them on my Instagram feed @duringquiettime. I really think that this combination of improvisation and paper piecing, takes paper pieced design to a new level and it is so fun!!! 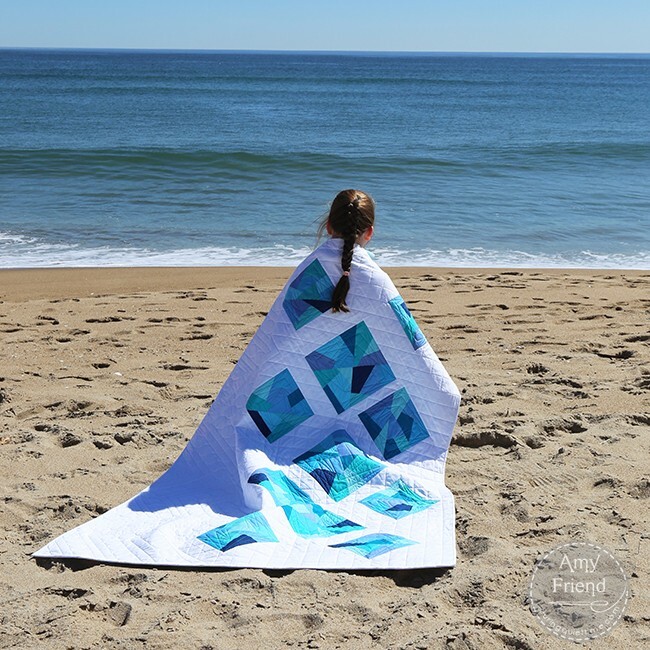 This is one of the quilts from the book; it’s called Sea Glass. It’s one of the quilts that I showed my students because it’s from the shape based section of my book. 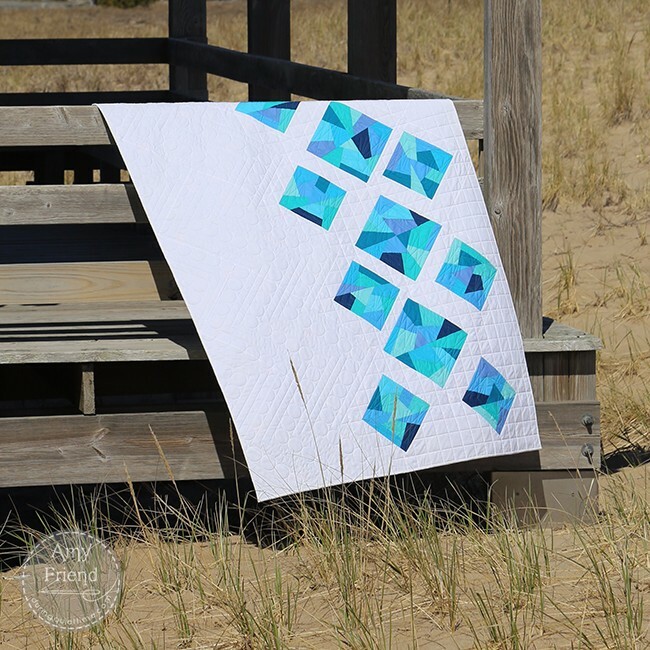 This quilt is composed of two paper pieced blocks, broken into a crazy quilt like design. The blocks are unevenly sashed, on point, and rotated, resulting in irregular spacing throughout which I just love. I normally quilt all my own quilts but chose to send this one out to Christina Lane of Sometimes Crafter. I feel like Christina really listened to me when I told her what I was looking for and she did impeccable work on my quilt. I told her that as a designer, I want the bold shapes of the piecing to be the first thing that you see. I wanted the quilting to be complimentary but not overpowering. The squares that were quilted in the background on the pieced side of the quilt, help emphasize the uneven nature of the spacing between blocks. 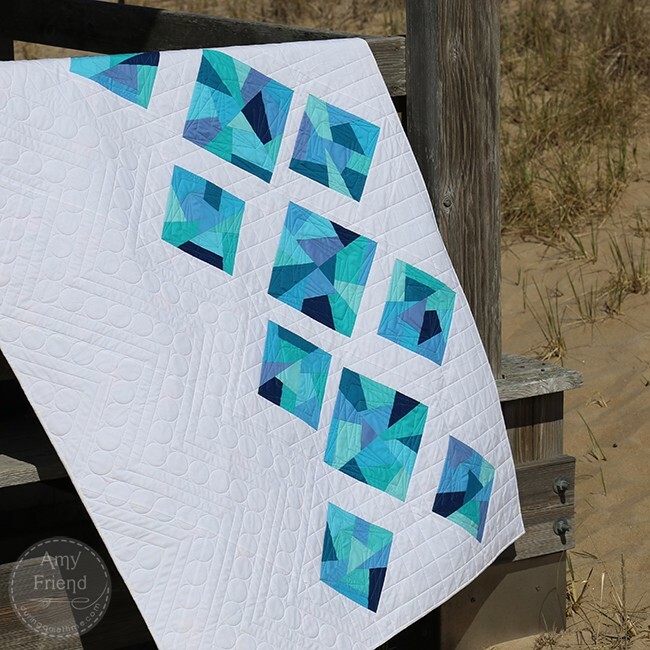 The quilting inside the squares suggests the prismatic quality of glass shards, which works well with the sharp and pointy piecing and the sea glass color palette. In the negative space, she quilted a zigzag edge to represent water washing onto the shore with circular bubbles for foam. I think it was a successful collaboration and I am happy to recommend Christina’s work. I need to give a shout out to my kids who where dragged around about this time last year on their school vacation so that I could take these photographs at the beach. While it might not look it, it was freezing and quite windy at the sea shore here in New England, and they were pretty good sports. They even modeled for me (though I didn’t end up using this photo in the book). They also hid behind the boardwalk railing to hold the corner of my quilt while I took the pictures. They were under strict orders not to let go for anything! If you are interested in a copy of my book, you can purchase a signed copy with free shipping from my Etsy shop and of course, you can check your local quilt shop and book store or buy from Amazon.